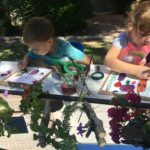 Eric Bucher, Christie Colunga and Marjorie Ruiz discuss exploring art and the natural world in celebration of the Week of the Young Child™ and “Artsy Thursday.” Learn more. Newly elected NAEYC Governing Board Member-at-Large Nicol Russell talks about learning the system, building bridges, and what she hopes to accomplish in her new role. Read the story. My focus as President is to coordinate advocacy support with our partners and promote a vibrant and diverse membership that represents the strengths and values the voices of early childhood professionals across the state. Learn more. 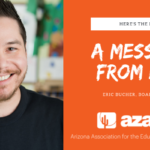 When I began my term as President of the Governing Board of AzAEYC, I set a goal to focus on what I called the "three P's" -- the people, the programs, and the profession. Read more. 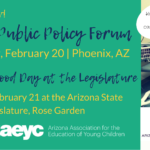 The 2019 Arizona Public Policy Forum is THE place to sharpen advocacy skills and help move a nonpartisan agenda in Arizona in support of young children and the early childhood education profession. Learn more. Why does a file cabinet need to be at least 3 feet from the door? Why does a trash can have to have a lid? Why can't we use crockpots? 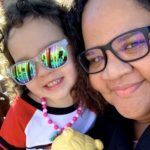 Raegina Rico developed a passion and an urgency that led her to become a child care licensing consultant. 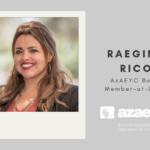 AzAEYC’s newest board member talks about her work and why safety in the classroom matters so very, very much. Read more. 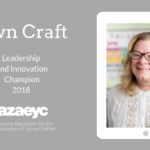 The first inaugural Leadership and Innovation Champion Award was presented to Dawn Craft at AzAEYC’s Annual Meeting on September 29, 2018. Dawn was a key player in skillfully guiding AzAEYC through the recent NAEYC affiliate re-organization. 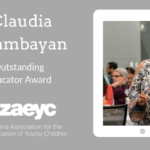 She was instrumental in securing a Virginia G. Piper Foundation grant to support AZToolkit, AzAEYC's shared resources web platform. Learn more. 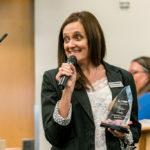 The first inaugural Advocacy Champion Award was presented to Shanna Kukla at AzAEYC’s Annual Meeting on September 29, 2018. Shanna answered five questions about her career, her work in the field, and reflected on the value of the pursuit of diversity and equity in early childhood education. Learn more. 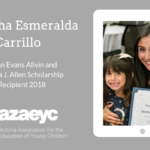 The Rhian Evans Allvin and Joshua J. Allen Scholarship 2018 was presented to Martha Esmeralda Carrillo of Paradise Valley Community College at AzAEYC’s Annual Meeting on September 29, 2018. Learn more about Esmeralda.